On the SQL page, click the Execute tab. Enter an SQL query in the SQL Query text box. Click Execute Query. The query results are displayed at the bottom of the page. This query returns the contacts who have fax numbers. Notice the use of the -> in the query. This is the Caché implicit join operator or arrow syntax. It provides an easy shorthand for retrieving data from related tables without explicitly specifying a JOIN. 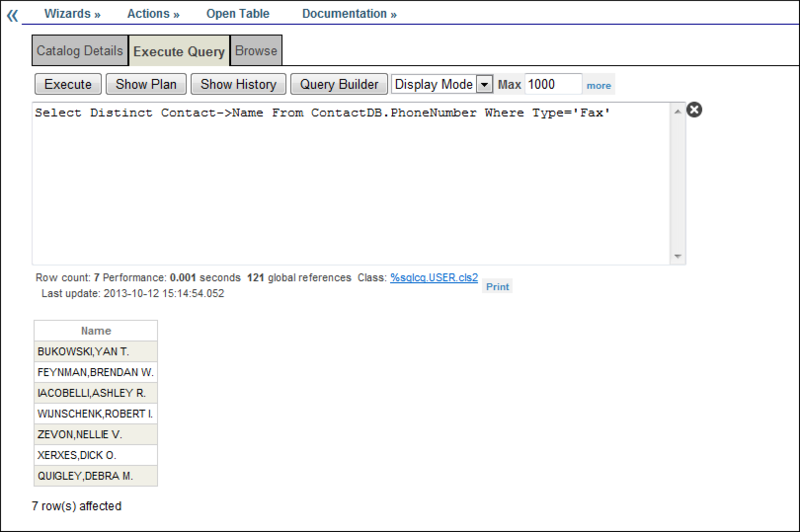 You can also query the database using your favorite ODBC or JDBC query tool. To learn more about connecting to Caché using ODBC, read Using Caché with ODBC. To learn more about connecting to Caché using JDBC, read Using Caché with JDBC. For more information on the Caché implicit join operator (arrow syntax), read Implicit Joins (Arrow Syntax) in Using Caché SQL.